HELP (Health Education, Leadership, & Prevention) Coalition of Clinton County took part in the U.S. Drug Enforcement Administration’s Prescription Drug Take-Back Day on Saturday. There were collection sites in Blanchester at The Exchange, Sabina at Uhl’s IGA, and in Wilmington at CVS. The medications that were dropped off will be combined with those dropped off at the permanent disposal locations (at the Clinton County Sheriff’s Office, the Wilmington Police Department, and the Sabina Police Department) which are then collected by the DEA for incineration. 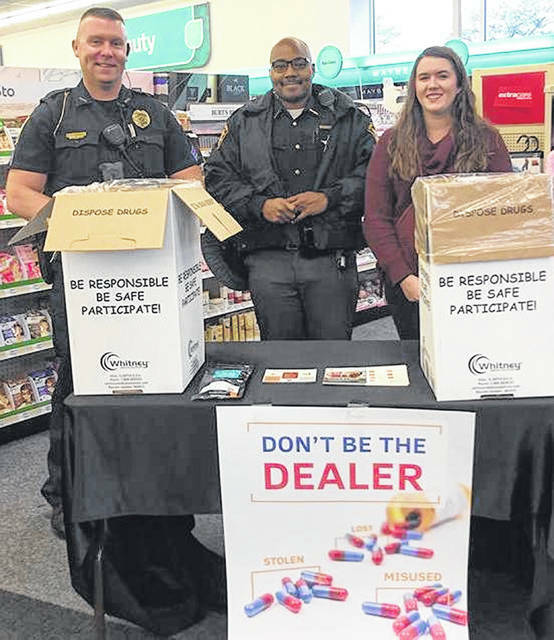 From left at the Wilmington CVS store are Wilmington police officer R. Cravens, Clinton County Sheriff’s Deputy E. Sylvester, and Olivia Long with Solutions Community Counseling & Recovery Centers. 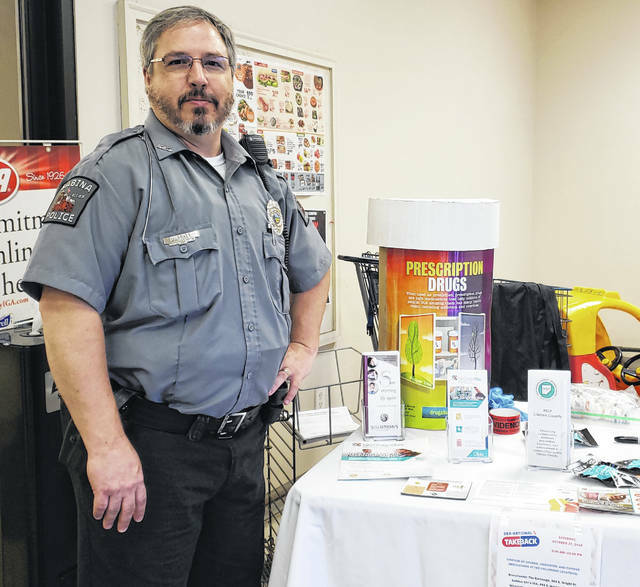 Sabina police officer C. Pratt at Uhl’s IGA in Sabina assists Saturday in the Prescription Drug Take-Back Day event. HELP (Health Education, Leadership, & Prevention) Clinton County Coalition Coordinator James Syphax said on Tuesday while exact totals aren’t in yet, he would not hesitate to call the event in Clinton County a success. There were collection sites in Blanchester at The Exchange, Sabina at Uhl’s IGA, and in Wilmington at CVS. HELP Clinton County, with the support of Solutions and of Mental Health Recovery Services, also has at-home disposal kits available for anyone who needs one. Any interested party can contact Syphax for details at his e-mail address jsyphax@solutionsccrc.org or they can send a message on Facebook to Facebook.com/HELPClintonCo .